Connect directly to popular data sources like Azure SQL Database, Microsoft SQL Server, and SQL Server Analysis Services. All these capabilities are available now with paginated reports in Power BI as part of this public preview, along with new features like the ability to view your paginated reports in the Power BI mobile apps. And since our plan is to provide all of the same great features you have today in Reporting Services and much more, you’ll see new functionality added regularly throughout the preview period, including support for scheduling and sending paginated reports using e-mail subscriptions (with attachments! ), embedding in third-party applications, authoring reports against Power BI datasets, and the ability to seamlessly drill through from a Power BI report to a paginated report in the service. 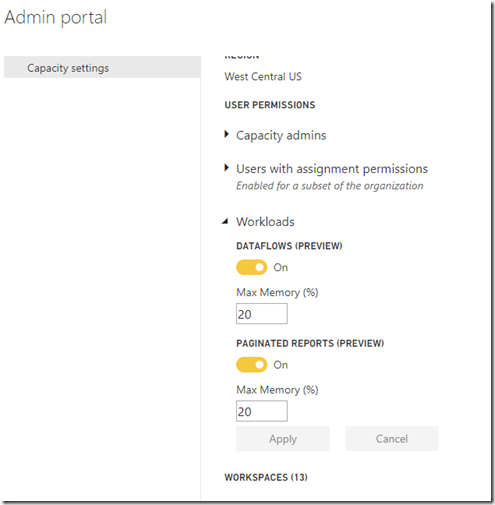 To start using paginated reports in Power BI Premium, head to your Capacity settings page in the Power BI Admin Portal and enable the paginated reports workload and set the amount of memory you’d like to dedicate to it. By default, 20% of your memory will be dedicated to paginated reports. You can dedicate up to 50% of your total memory to this workload. This amount can be scaled up or down at any time, depending on your needs. Later in the public preview, we’ll allow even higher amounts of memory be dedicated to paginated reports for a capacity. 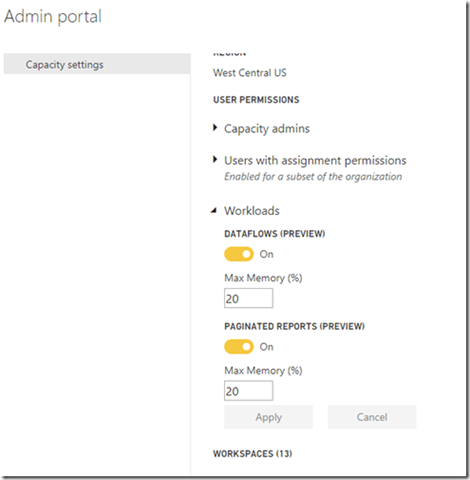 Once enabled, reports can be created and uploaded into any Power BI workspace assigned to that capacity. 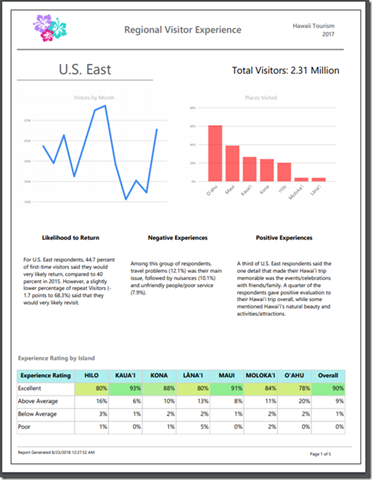 Paginated reports can be viewed and exported to several formats, including PDF, Word and PowerPoint, and shared with other Power BI users in your organization. 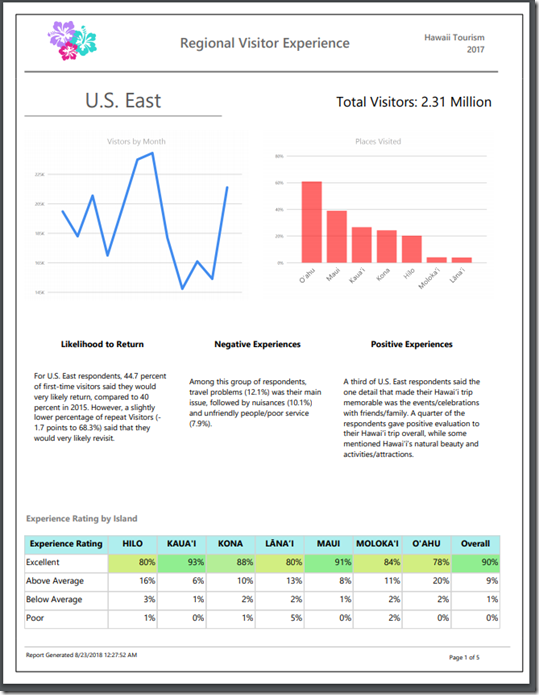 We’ve put together extensive documentation on this new report type to help you get started, whether you’re an author, administrator, or someone just viewing reports. We cover the full list of supported features and known limitations, along with links to tutorials and sample content. This is the beginning of an exciting journey to bring the full breadth of capabilities from Reporting Services to the Power BI service, and we look forward to working with all of you as we do so. Please leave us your feedback in the comments section below and let us know what you think.